A new level pack is making waves in this chaotic multiplayer cooking game. Family-friendly cooking game Overcooked 2 launched on console and PC earlier this year. The sequel to the original Overcooked from 2016 lets up to four players team up to cook dishes and serve customers in wacky restaurants set in locations like a magic school, a mine, and an alien planet. If your family has finished everything Overcooked 2 has to offer, but you aren’t ready to move onto a new game just yet, you’re in luck! A new downloadable content (DLC) pack has been released for the game called Surf ‘n’ Turf. This beach-themed pack includes 12 new story levels to complete across a variety of new kitchens, like a raft that’s floating down the river. The pack also includes new Versus and Kevin levels. As AllGamers reported, Kevin levels were some of the most difficult stages to complete in the base game of Overcooked 2, so we expect the Kevin levels in the Surf ‘n’ Turf pack to be just as challenging. 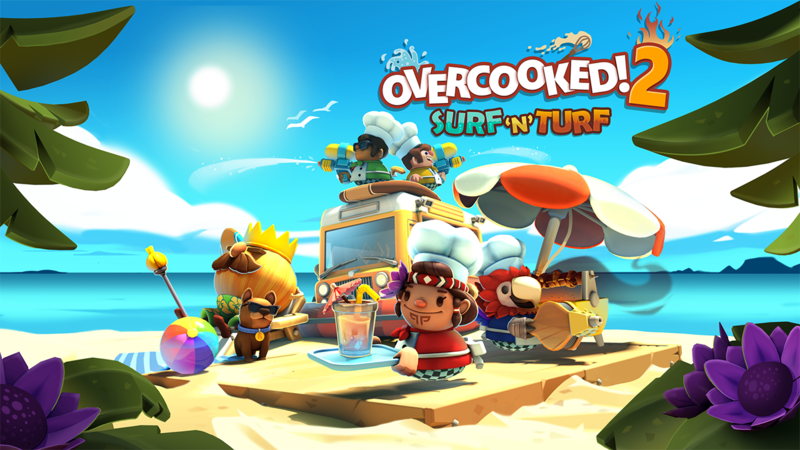 The Surf ‘n’ Turf pack also features new playable chef characters and new recipes for kebabs and smoothies. A new water pistol is also included, which will let players put out fires around the kitchen (literally). In a blog post, Team17, the publisher of Overcooked 2, said the water pistol has another secret use, but players will need to figure out what it is themselves. Finally, once players complete the 12 new campaign levels in this pack, they’ll be able to go back through them on a New Game+ mode, which increases the difficulty level. The Surf ‘n’ Turf DLC is now available to purchase for $5.99 on Switch, PlayStation 4, Xbox One, PC, and Mac. The base game -- which you’ll need to play this DLC -- is currently $24.99. Want to learn more about Overcooked 2? Check out our SuperParent First Look to see the game in action. Dan Whitehead started playing video games in the 1980s, with the text adventure Hunt the Wumpus. He's been writing professionally about them since 1991 and has worked on games related projects for organizations such as Guinness World Records and BAFTA. He has two children, now aged 15 and 11, and is a passionate advocate for good quality games designed for kids.